Bead, TierraCast®, antique rhodium-plated pewter (tin-based alloy), 7x6mm double-sided flat oval with awareness ribbon. Sold per pkg of 2. 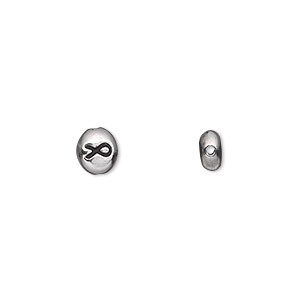 Bead, TierraCast®, antique rhodium-plated pewter (tin-based alloy), 7x6mm double-sided flat oval with awareness ribbon and 0.6mm hole. Sold per pkg of 4. NEW - Bead, TierraCast®, antique rhodium-plated pewter (tin-based alloy), 7x6mm double-sided flat oval with awareness ribbon and 0.6mm hole. Sold per pkg of 20.